I just love these cute little snowman fingers. I just can’t stop looking at them. 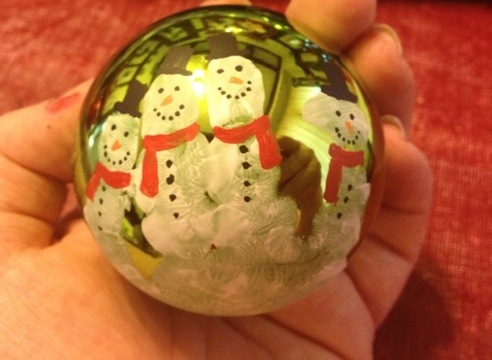 To do this project all you need is glass ball ornaments and acrylic paint. I spread a thin even amount of white paint onto a paper plate. I had my son strapped into his high hair. I had the ornament close by and ready. I dipped his hand and then got him to grab on to the ornament. After i had my hand prints set i painted on little hats and scarves and the snowmen’s little faces. You could get more creative with your hats and scarves. I went for the classic snowman look. 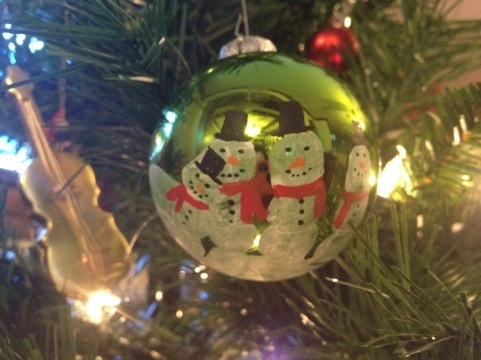 I made sure to have extra ornaments on hand in case I messed one up. Just as I thought my first one was the messiest. Really that one was fine too. My best advice is to just relax and use the flaws to your advantage. Anywhere that I saw streaks where his finger smudged the paint I made the snowmen’s scarves look like their blowing in the wind . Really they’re all adorable. You can also wipe with a paper towel and warm water any serious mistakes. These are SO adorable and would make a great gift for grandparents. On the back I wrote his name and the year with a permanent marker. I can’t wait to share these with family on Christmas. These are the most adorable things I’ve seen in a long time! How creative! Did you think of this yourself or find it somewhere? I’m definitely gonna do this with Carlie next year! Thanks Connie! I actually saw them on Pinterest (of course). The second I saw them I knew I had to try them with my kids. 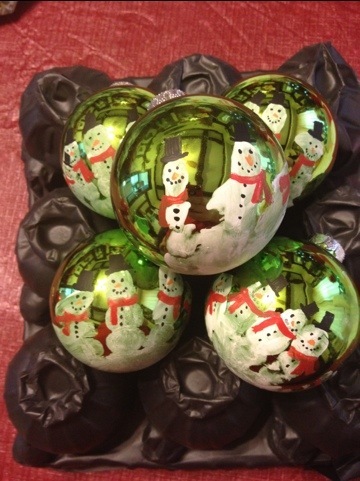 I absolutely love them and if you wanted to try to do it this year JoAnnes has ornaments 60% off, that’s where I got mine.